InkSupply.com CFS systems provide photographers with an outstanding price-per-print solution without sacrificing print quality or requiring refilling/switching cartridges. 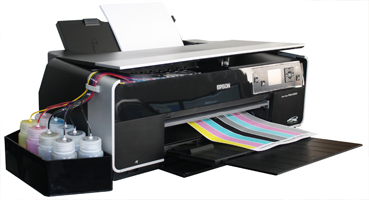 The R3000 also allows the user to switch between Glossy and Matte media without requiring expensive black ink changes or extra cleaning cycles. Utilizing our proven K4 Vivid ink set (Yellow, Photo Black, Eboni Black, Cyan, V. Magenta, VLt. Magenta, Lt. Cyan, Lt. Black and LLt. Black), the InkSupply.com R3000 CFS system is ideal for professional and fine art photography on both Matte and Glossy media. Featuring the Vivid Magenta, Vivid Light Magenta, and our Eboni Matte Black, the R3000 offers an astounding color gamut for brilliant reds, blues, purples and striking blacks. The K4 Vivid inks provide the same archival ratings and accurate colors that InkSupply customers have come to depend on for years. These inks are designed to work on matte finish paper, semi-gloss or glossy papers. It provides a more realistic looking print by eliminating the distracting shine characteristic of other inks. The Inksupply.com K4 ink sets have 9 inks; 4 black (matte, photo, light black, light-light black) and 5 color (CMYLcLm). The new compatible Vivid Magenta is able to produce a spectacular cornucopia of dazzling blues, reds, and purples. As with all InkSupply.com Inks, K4 is proudly manufactured in the US to the highest quality specifications available.